Pittsburgh, PA – August 12, 2015 – The Pittsburgh Conference on Analytical Chemistry and Applied Spectroscopy (a Pennsylvania non-profit Corporation) and its co-sponsoring technical societies, the Spectroscopy Society of Pittsburgh (SSP) and the Society for Analytical Chemists of Pittsburgh (SACP) are pleased to accept applications for the 2016 Pittsburgh Conference Memorial National College Grants (PCMNCG) Program. Awards may be used as part of “Matching Grant” programs; use of matching funds to increase the overall impact of the grant will be considered in the evaluation of proposals and is highly encouraged. Please visit www.pittcon.org (http://pittcon.org/pcmncg) to see all eligibility requirements and to download an application. The submission deadline is October 2, 2015. Click here (http://pittcon.org/pcmncg/#recipients) to view a list of the 2015 awardees. 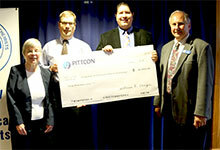 Proceeds from Pittcon are used by the SACP and the SSP to promote science education at all levels. The PCMNCG program is one aspect of the efforts of the Pittcon volunteer committee, staff, and sponsoring societies to support science education.